Meet Skylar Raiyn Johnson, an accomplished seamstress from Gainesville, Virginia with her sights set on sewing for Beyoncé. Oh, by the way, she's still in sixth grade. WASHINGTON — An accomplished sixth-grade seamstress from Gainesville, Virginia has been sewing since she was 8-years-old — and now Skylar Raiyn Johnson has her sights set on Beyoncé. “She’s one of my dream clients,” Johnson said of the pop star. High profile clients are nothing new to the Founder and CEO of Fly Sky Sew, who designed the outfit worn by Loudoun County Chair of the Board of Supervisors Phyllis Randall during the State Of The County Address in April. Skylar’s favorite subject in school and extracurricular interests compliment her passion for design. She likes math and art, which helps when you’re measuring material and cutting into shape a vision put down on paper after “seeing” it in the back of your head. “I like to do sketches and do a lot of paining,” she said. The young designer’s mom, Danyel Trammell, said Johnson doesn’t let her experiences go to her head. Johnson said she just likes seeing people in her designs. So what’s next? 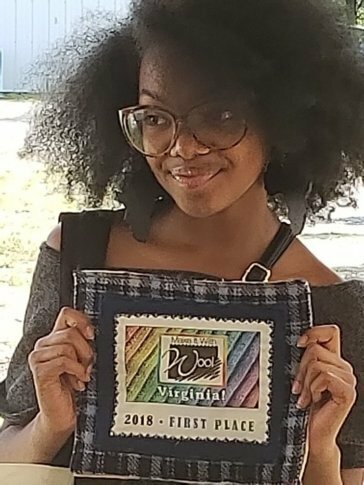 Johnson said a manufacturer is working to produce the wool outfit she created to win this fall’s “Make It In Wool, Virginia!” competition. And, of course, you never know when Beyoncé might call.